Trials of the Monkey a fine personal & reported stealth memoir. Trials of the Monkey: An Accidental Memoir by Matthew Chapman. Picador, 367 pp. 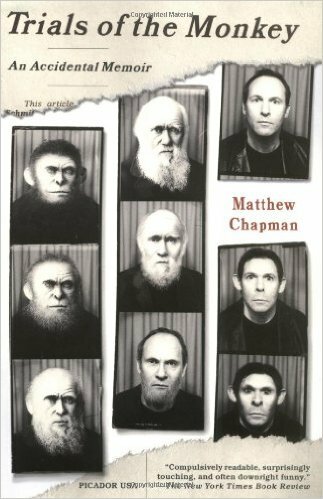 My latest enjoyable discovery in this realm is Matthew Chapman’s Trials of the Monkey: An Accidental Memoir. Funny and personally poignant, it’s also an interestingly reported foray into the Bible Belt by a doubting English descendant of Charles Darwin. I admire the way Chapman writes honestly about himself even as he laughs at others, especially evangelical Bible thumpers, but always with a compassionate wink. He both discerns and forgives others’ crutches and foibles, having racked up so many disasters himself. He talks at length, often in brave encounters, with people who are stunningly different from himself. These folks range from scary barflies to sweet, complexly human, true-believing students from a fundamentalist college. Though the surface story concerns Chapman’s attempt to cover the reenactment of the Scopes Monkey Trial in Dayton, Tennessee, it’s ultimately as much about Chapman’s perspective, from weary middle age, on his own delinquent youth—which by work, willpower, and talent he redeemed. Chapman, now based in New York, found success as a Hollywood screenwriter and director. But he’s the monkey of his book’s title—a workaholic, alcoholic fellow who adores his daughter and loves his wife but whose own life is rather messy. His memoir is long and at times dense, but along with Chapman’s appealing voice and compelling stories it offers a refreshing structure. It’s braided, alternating between Chapman’s road trips into the American south and tales of his chaotic boarding school days and dreadful early jobs. He’s haunted by his mother, a depressive who smoked and drank herself to death in the Darwin family tradition. Chapman cannot accept facile literalist religion, but I admired the fair hearings he gave such pilgrims. He made an impressive immersion journalist. And I found true and moving his yearning for spiritual solace. “It may be helping shape a subgenre by focusing and encouraging writers to include themselves while inquiring into a larger external subject.” Great observation Richard, and I am a prime example. Thanks for this idea of “stealth memoir,” Richard. I think I am moving toward something like this in my Jubilación project. I want to do a journalist survey of the fields of aging, life planning, death and dying, and vocation (too many, I know!). The juice will come as I find my own voice as a vulnerable elder-in-the-making. Oh, you must weave yourself in! To me, it would lift it above just journalism, when you have skin in the game. Thanks for this review, Richard. It sounds like a very good “read,” in the entertainment sense, as well as being a thought-fest (if that’s a word). Happy Spring! Thanks, Victoria. Yes, a fun read, with ideas and undercurrents aplenty. Upon your recommendation, I read the book and it’s now one of my “newest” favorite books. The book operates on so many different levels: travelogue, memoir, a spiritual meditation and a dishy tell all, though he mostly tells about himself and his own family. In my opinion, it’s also one of the best modern commentaries written on the South by someone from another country. Thanks for reporting back! I found it really enjoyable, too.